I think a planetary nebula. Sometimes they look oversized in Celestia according to the add-on . 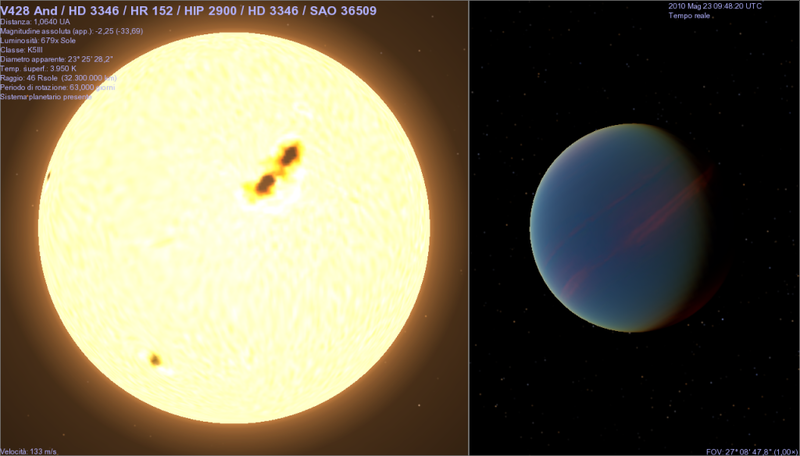 Thread bump: some water-rich Jovians and a bunch of brand-new planets from latest SuperWASP set. 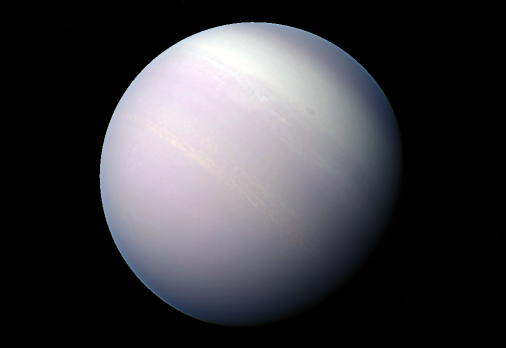 - Water Jovian HD 99109 b. Accomplishing a request. 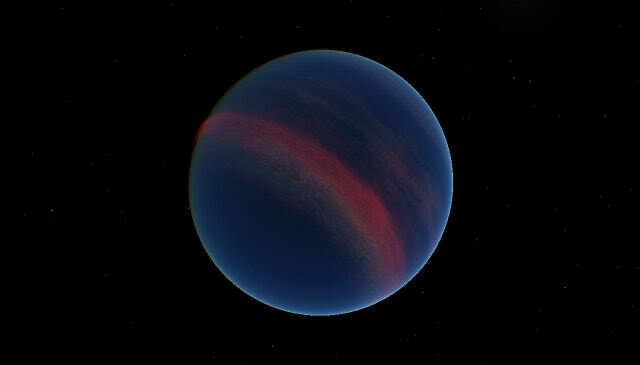 - Pi Mensae, massive planet within snowline. 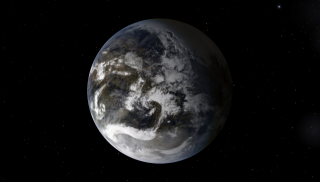 Assuming great water amounts, but I'm planning a new version, more cloudy and ammonia-rich. 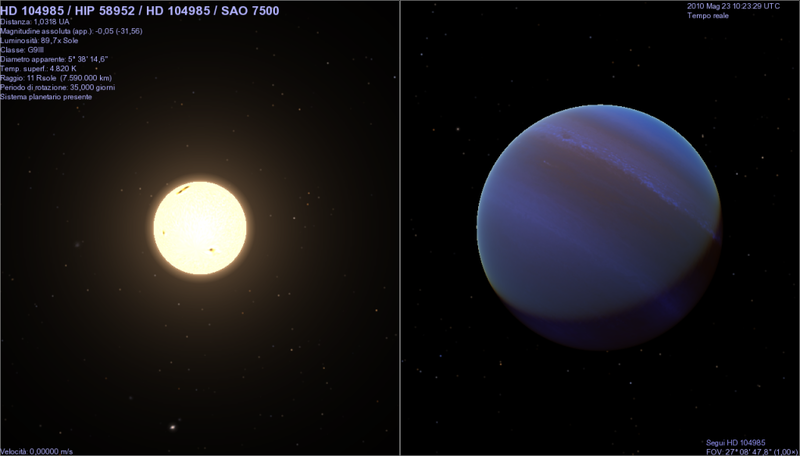 Assuming the same radius of Jupiter, mean density around 13.7 g/cc. 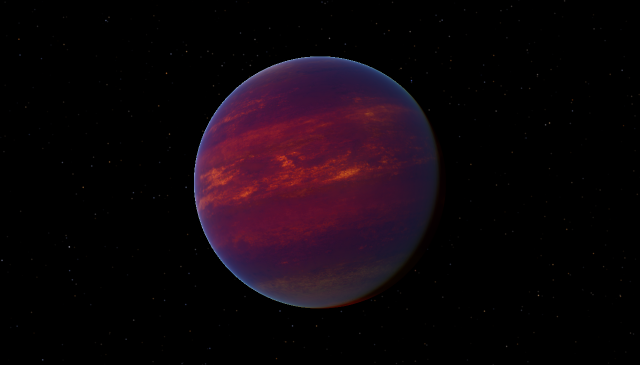 Remarkably similar to a brown dwarf, rather a planet. 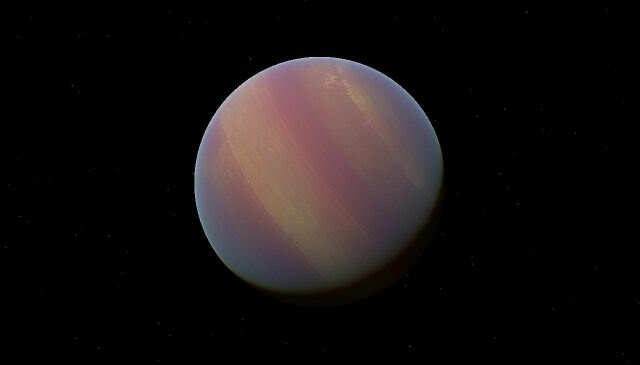 - WASP-29 b: hot-Saturn or "dwarf-hot-Saturn", as you like. 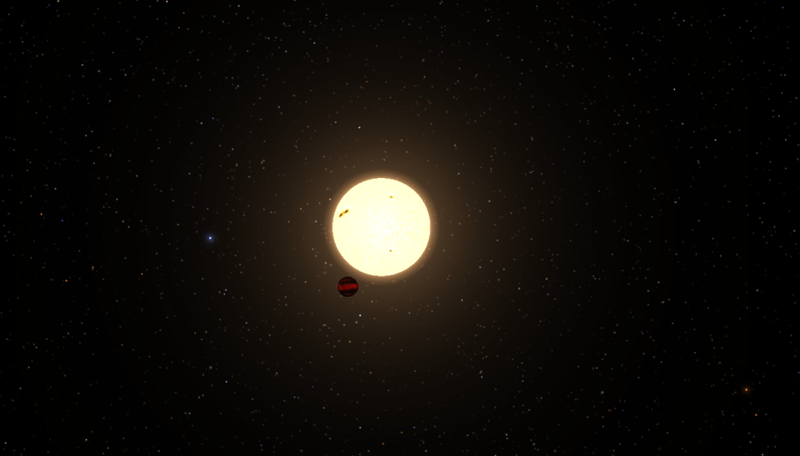 - WASP-33 b: first transiting planet around an A-type star. 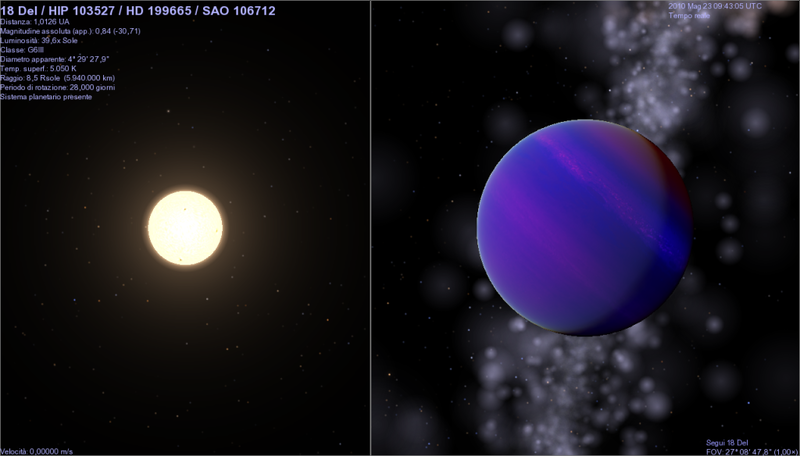 I bet few know about this one: V442 Cassiopeiae and "Trojan" planet. 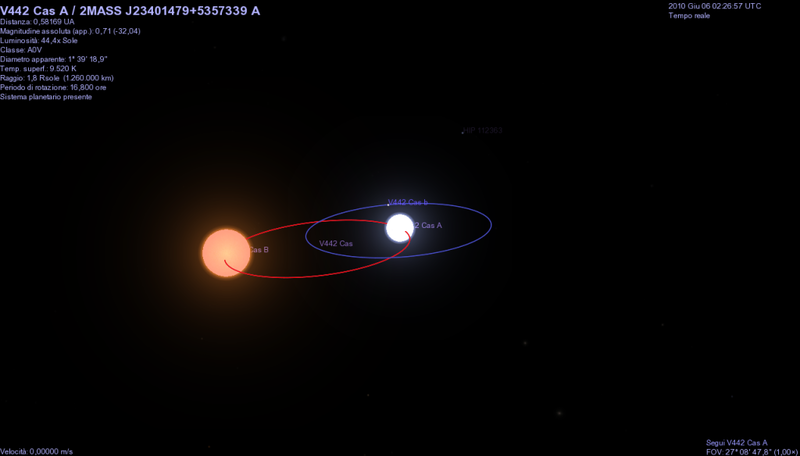 Quite a "menage-a-trois", with Algol-type eclipsing binary and epistellar planet in L4 point (individual orbits underlined). 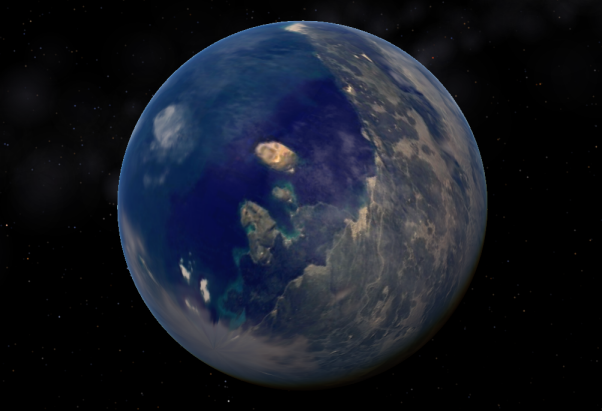 That planet doesn't look like it is anywhere near the Trojan point - the Trojan point should be at the vertex of an equilateral triangle in the plane of the binary, with the two stars occupying the other two vertices. It also doesn't look like the stars are at opposite sides of their mutual orbit? 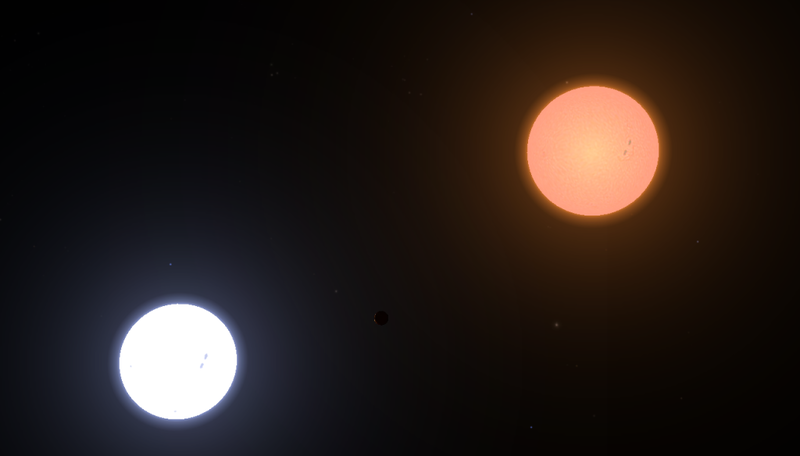 Nevertheless I would have thought this configuration would be highly unstable, unless the mass ratio between the two stars is extreme? Personally neither I do reckon such a kind of system to be likely. Just meant to "revive" this system after viewing this page. I'd like to hear also some feedback about GJ 667 C and Nemesis. 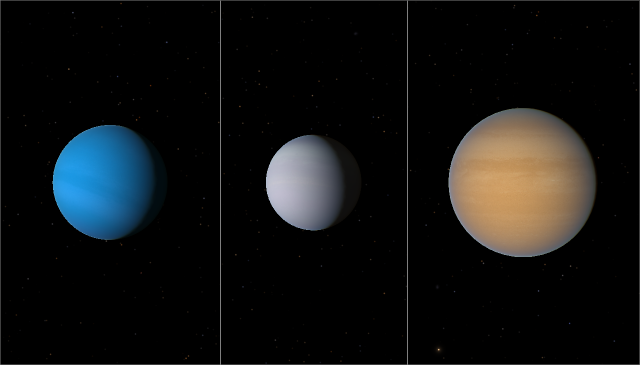 Thread bump: revisiting some old and new exoplanetary systems. 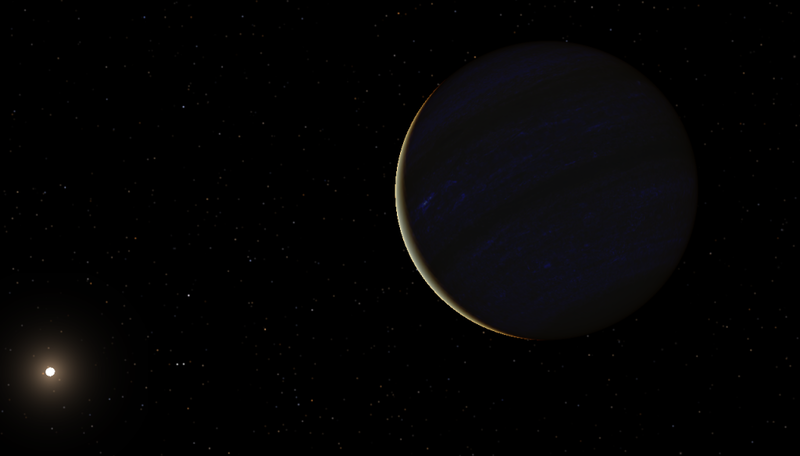 - Super-Earth Gliese 667 Cb. 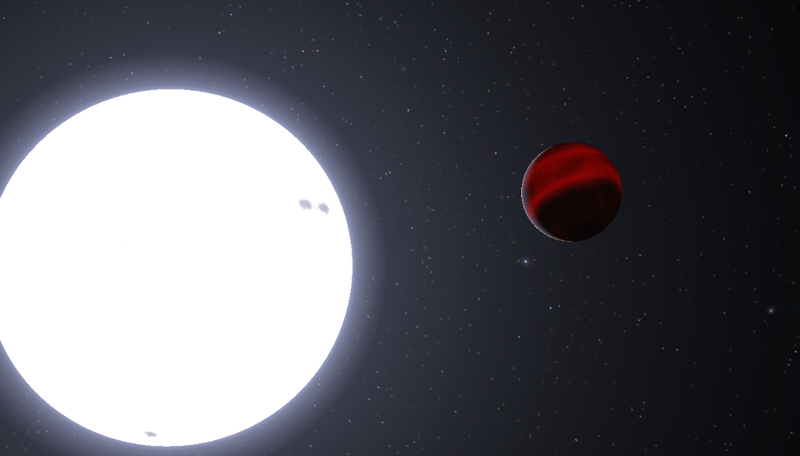 Binary in background. 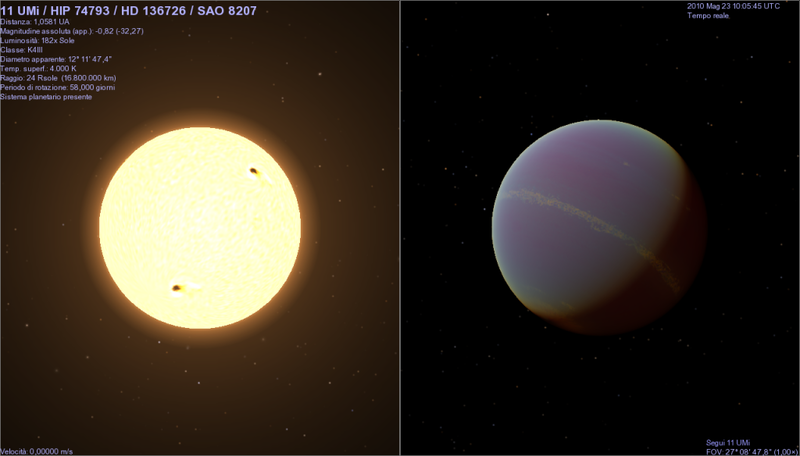 And also a putative moon around Ups And d.
- And even Rho1 Cancri. 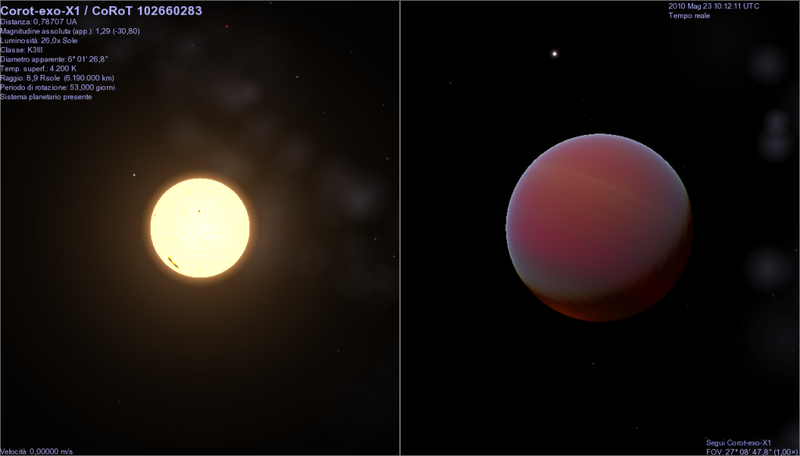 Nice work on the gas giant textures. 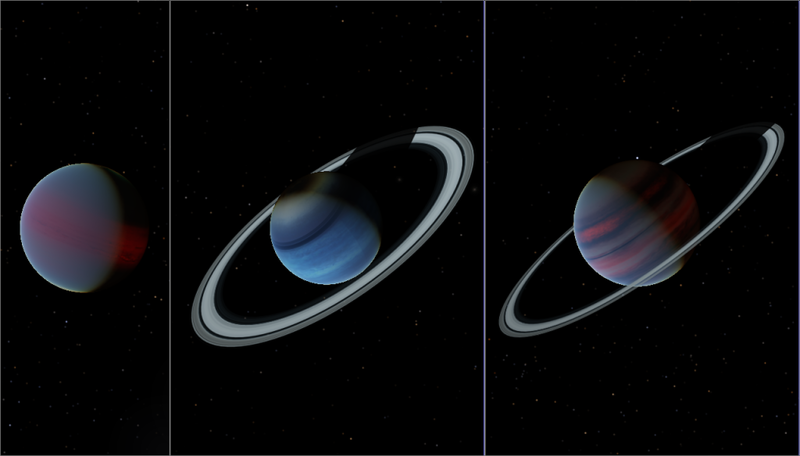 Perhaps try generating your own ring textures, those all look suspiciously Saturn-like. Here I have used Saturn-like indeed. 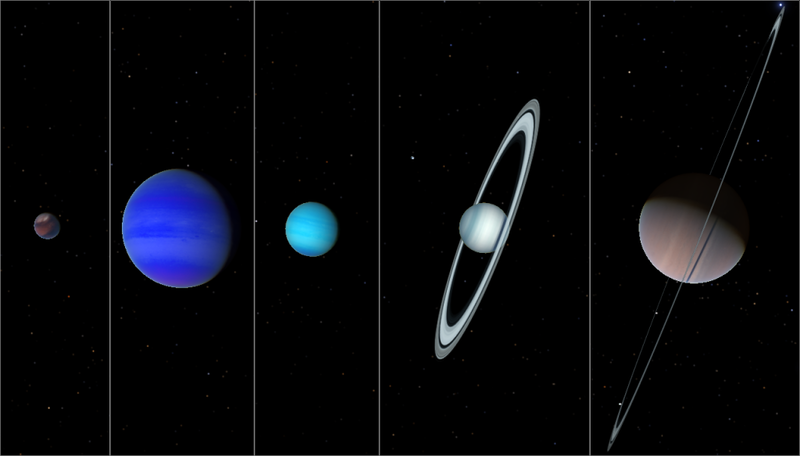 Other gas giants in "my stock" have different ring systems. Generous thread bump. 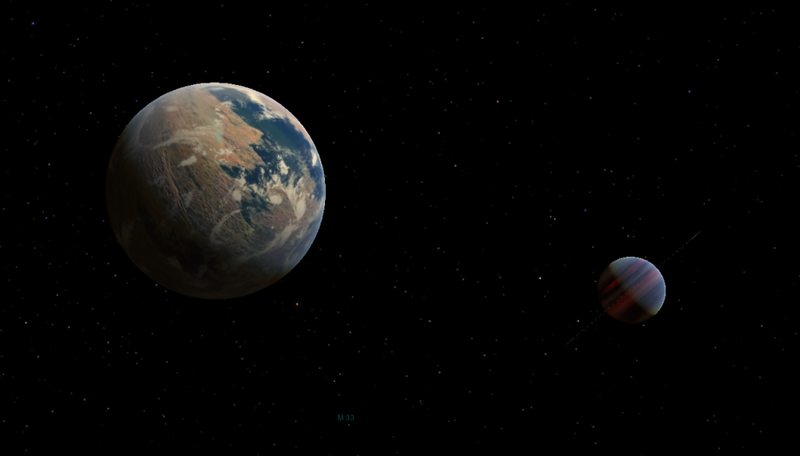 Planetary systems with giant star. Each star is depicted roughly 1 AUs away. 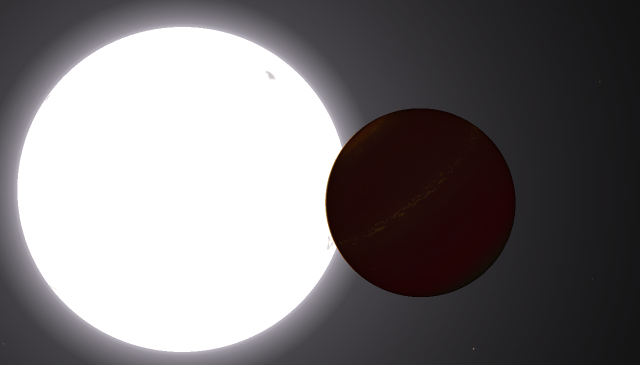 HD 3346 (K5III) And* brown dwarf around the most massive giant, so far detected. 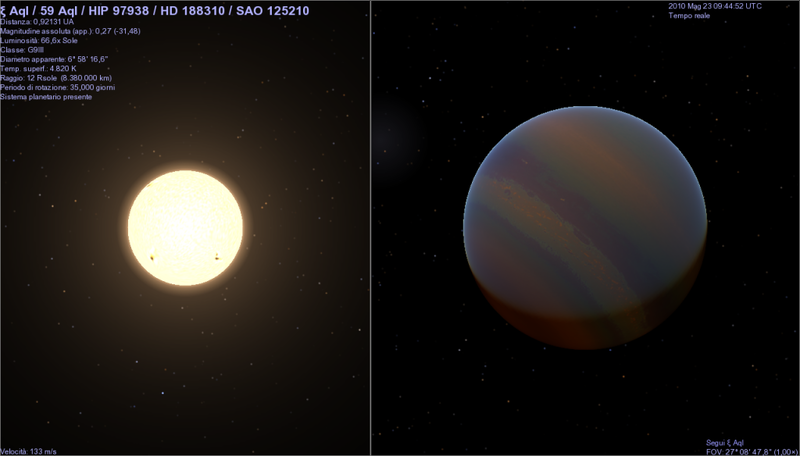 Finally a system waiting for confirmation: CoRoT 102660283 (I tentatively call "Corot-Exo-X1"). SpT= K3III, Mon. 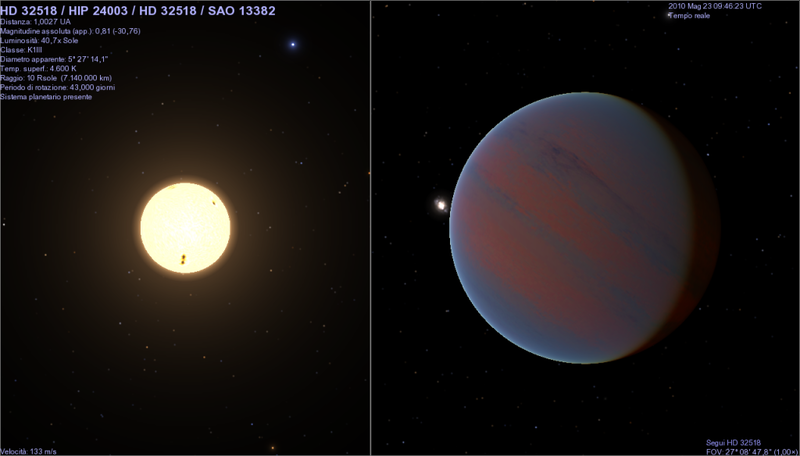 Includes a 23.4 Mj brown dwarf around a K3III giant. 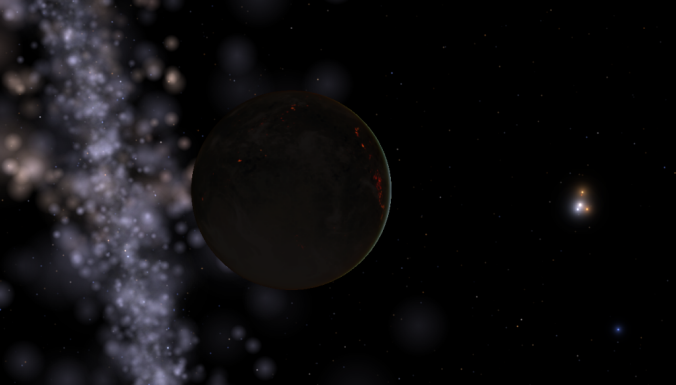 Lazarus wrote: Nice work on the gas giant textures. 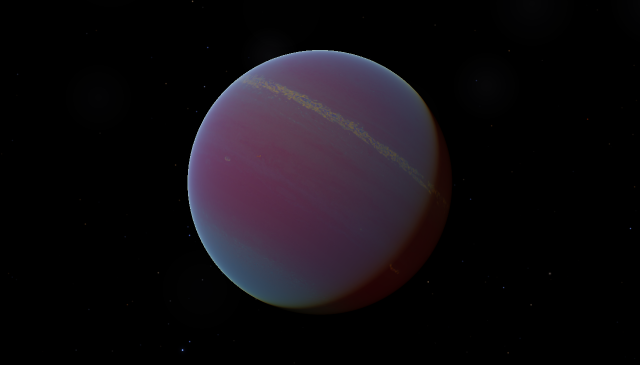 Perhaps try generating your own ring textures, those all look suspiciously Saturn-like. 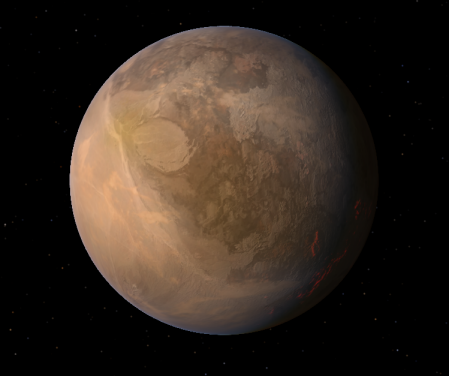 After a long series of real extrasolar planets or unconfirmed/unpublished exoplanet candidates, I wish to break the habit in this thread bump: putative rocky planets around nearby stars. Something new. 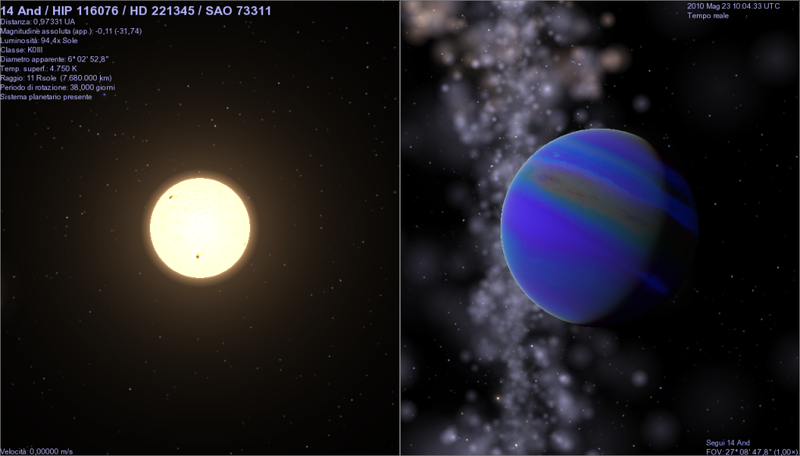 There is also something real within (as GJ 433 b) and something likely. Sure I won't ever exceed John M. Dollan's magnificient rocky worlds beauty, but I'd like to share these works. They shall feature in a Science Fiction of my own. I hope to have resized picture to comfortably viewable resolution. 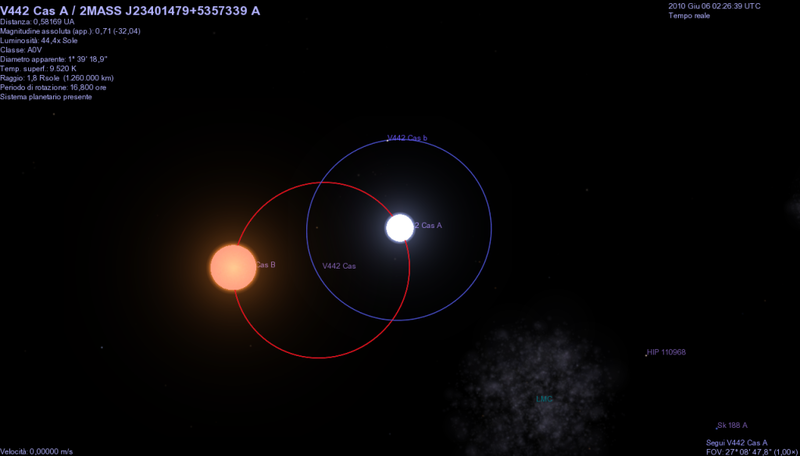 - Alpha Centauri A - 3rd of a 3 planets system and the least massive. 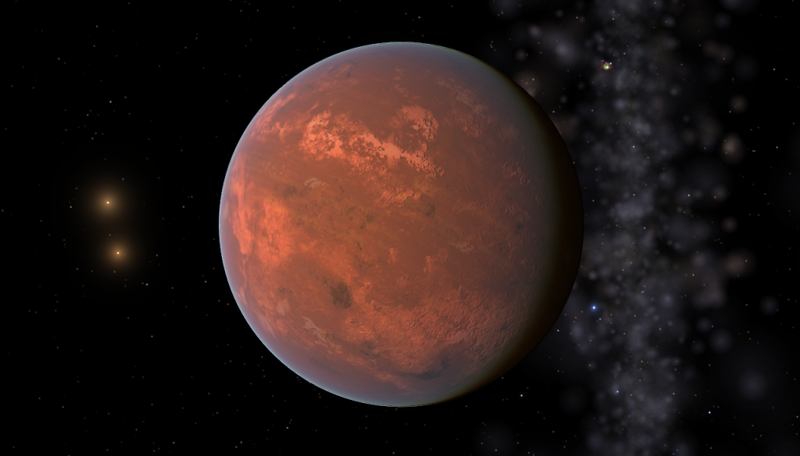 Twice the mass of Mars and within habitable zone. 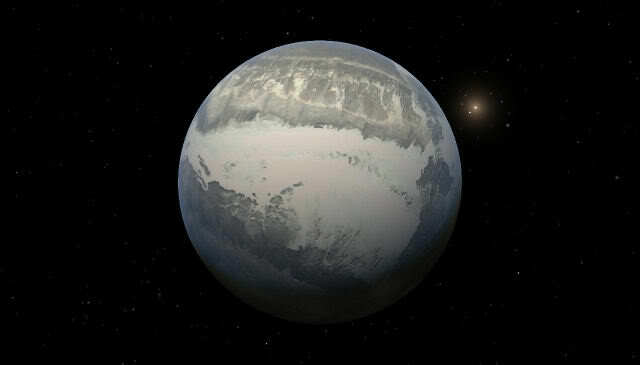 - Alpha Centauri B - 2nd of a 4 planets system. Venus-sized, in the inner edge of HZ. 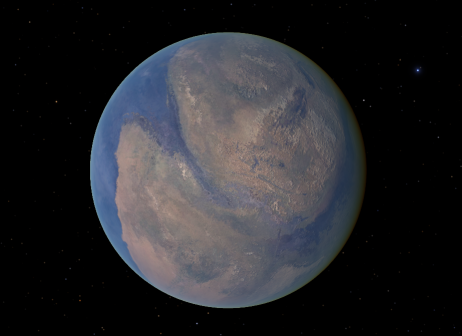 Hot oceans and deserts, halfway between Venus and the Earth. Geologically Active too. 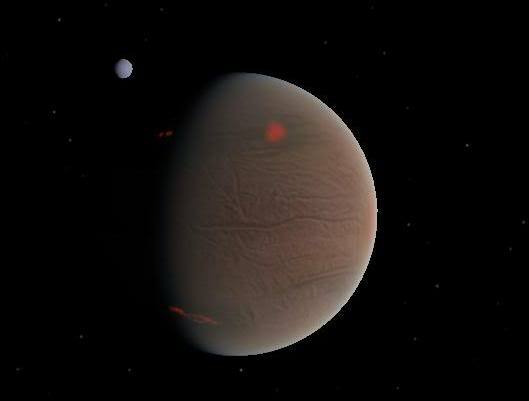 - Alpha Mensae - 4th planet, icy and arid planet with thrice the mass of Mars. 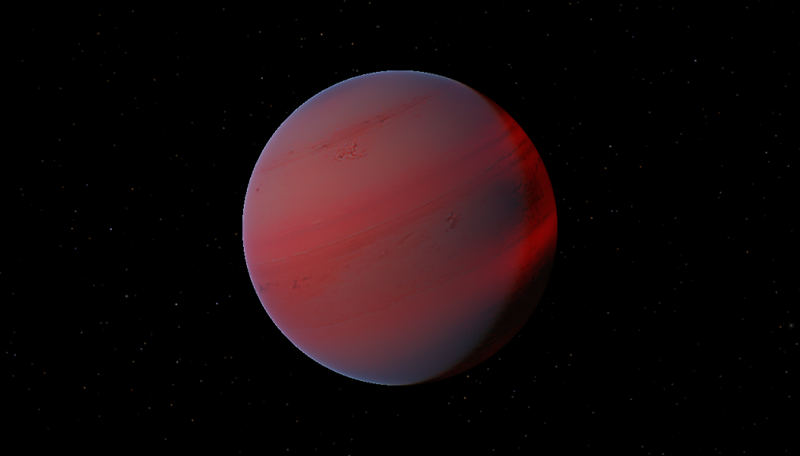 - Epsilon Eridani - an inner rocky planet, primaeval and active. A future Earth-kin? 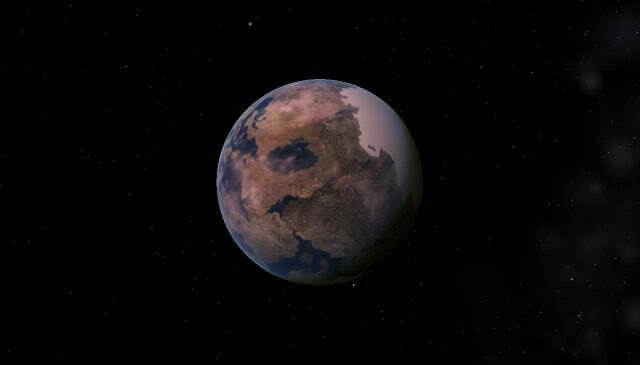 - Gliese 433 b* - the only real planet of the batch. 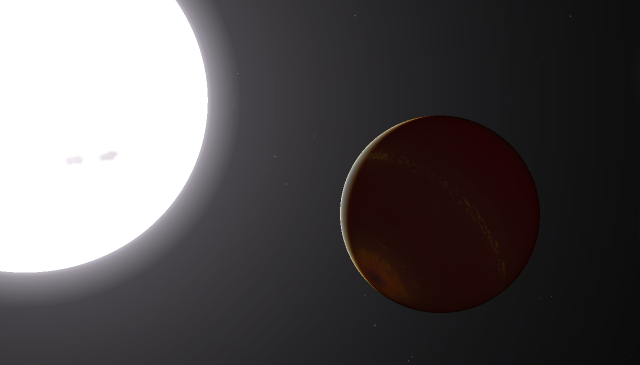 A hot super-Earth around a M dwarf. Yours are certainly better than mine. 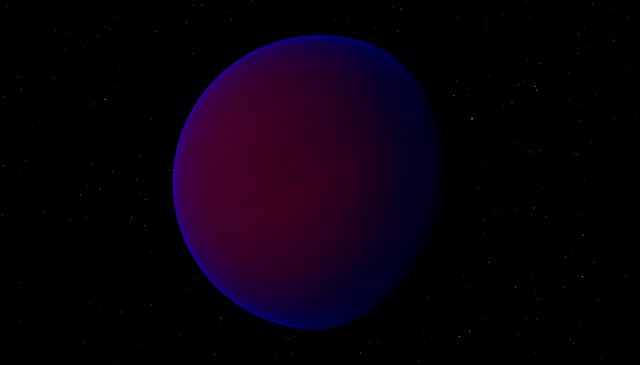 Here's my best effort so far at a hot Super-earth... this one being Gliese 581 e (with the background body being, of course, b). 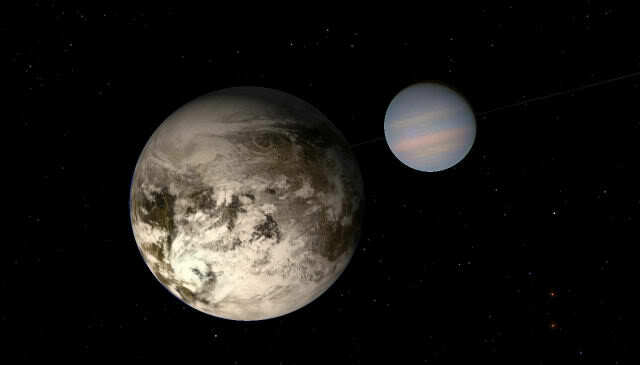 Sirius_Alpha wrote: Yours are certainly better than mine. 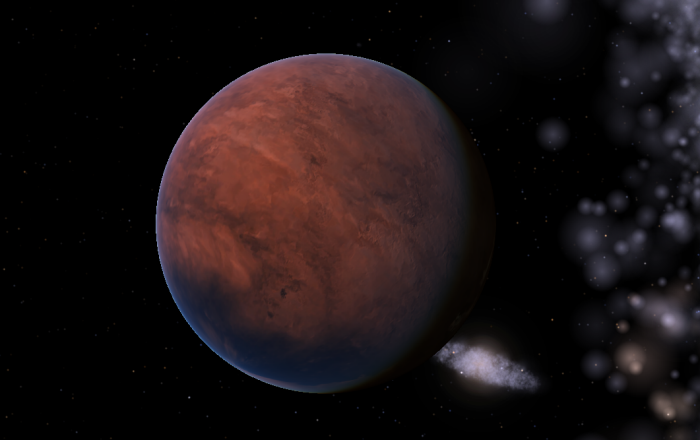 Here's my best effort so far at a hot Super-earth... this one being Gliese 581 e (with the background body being, of course, b). Well, you're on the good way. Keep up the good job. A bizzarre idea. 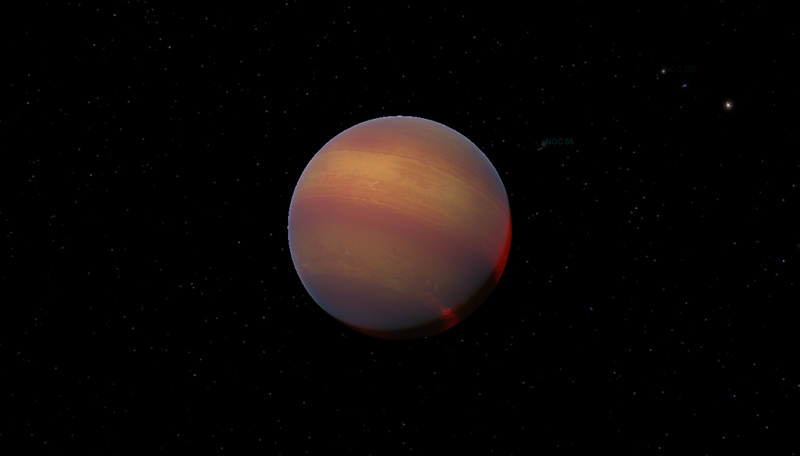 A young rocky rogue planet in Chamaeleon Dark Cloud. In the neighbours of multiple system DX Cha. How about? Very very very difficult, with current instrumentation. 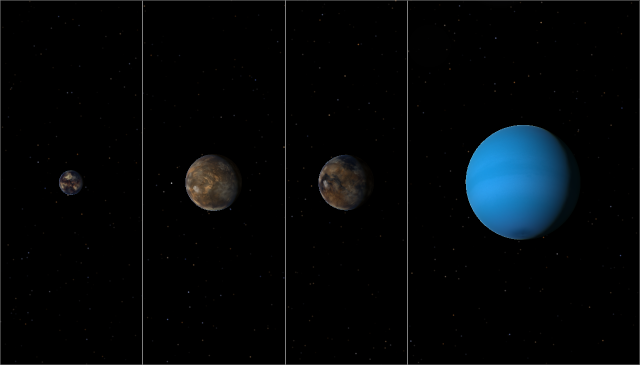 A bunch of fictional worlds orbiting (real) dim stars, M dwarfs included. 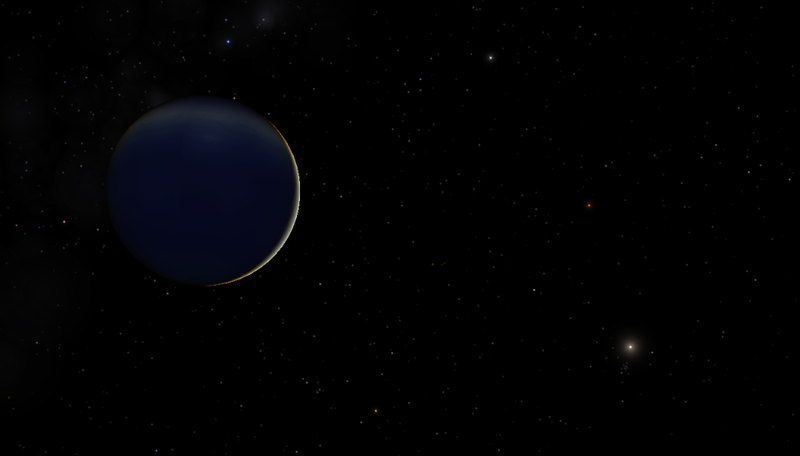 70 Ophiuchi B - another world supposed to orbit a gas giant, but quite colder, with a whole circumequatorial ocean frozen. 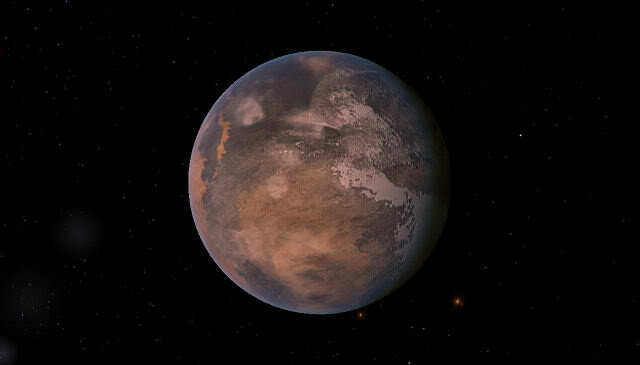 AD Leonis - well-known M dwarf primary target for Earth-sized worlds, but not like home, according to me. 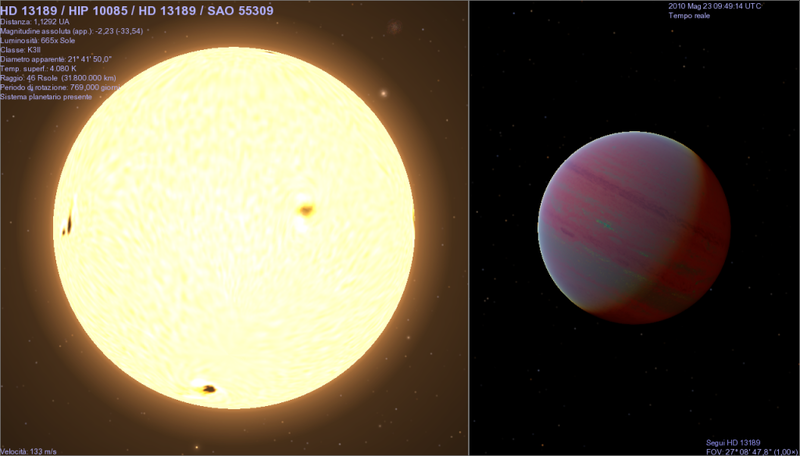 Lacaille 9352 - with a perpetual ice age world as in stereotypical tidally locked M-dwarf Earths. Enjoy and see you next thread bump. 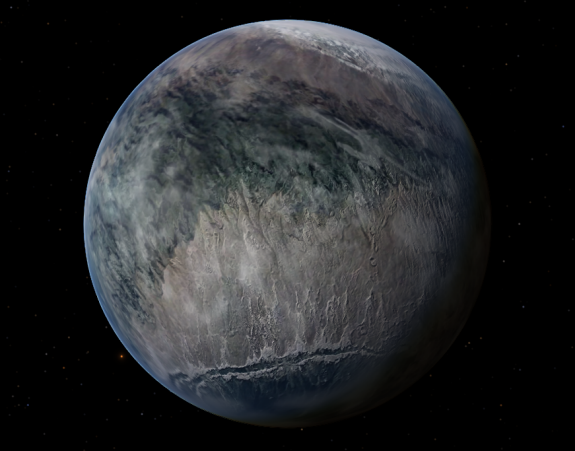 Plus a putative Earth-like planet within. I'd like to make a thread bump, since long time this topic is resting. 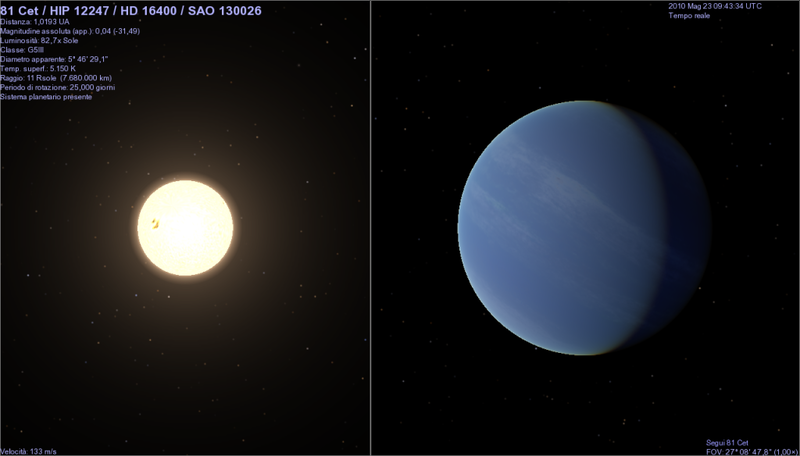 Some epistellar jovians of HATNet, in alphanumerical order. HAT-P-7 b - one of the most studied. HAT-P-15b - "that with heart of stone". 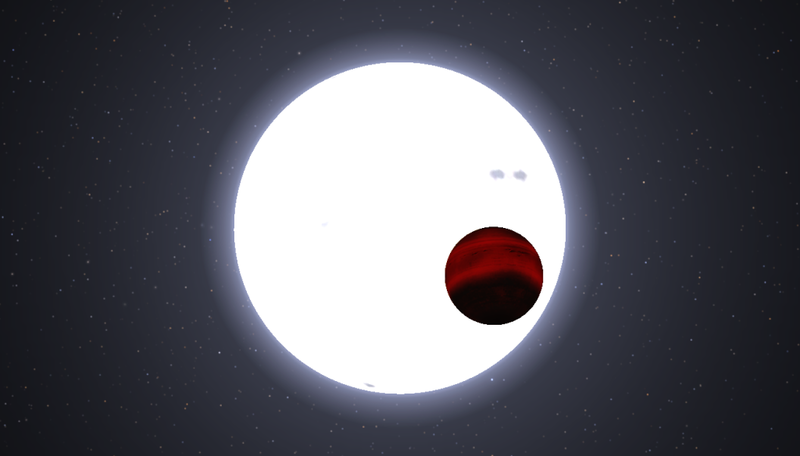 HAT-P-20 b - massive hot Jupiter, the heavy one of the batch. 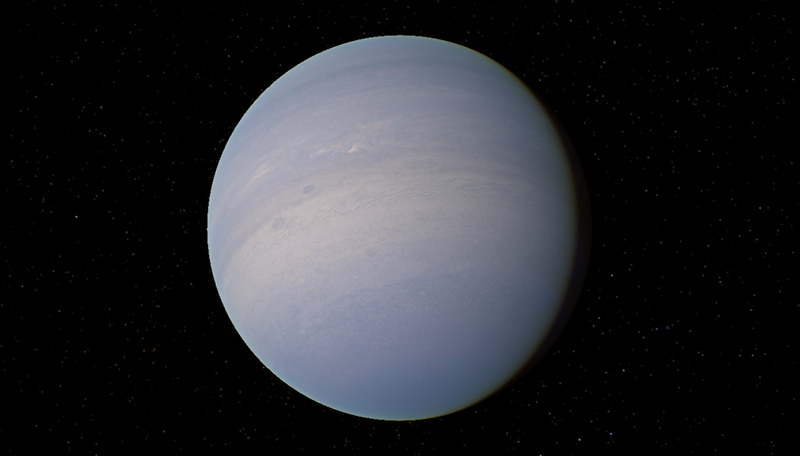 - Neptune-like = faint, thin, and unevenly distributed. 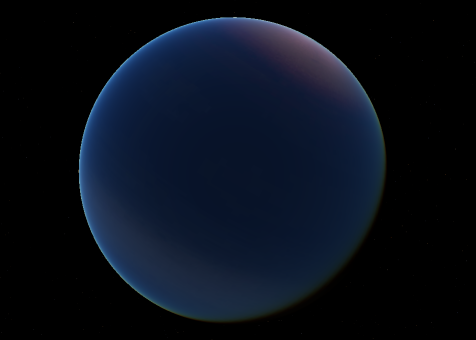 - Uranus-like = faint, thin. - bannanna-like, where it's not a complete circle. - thick, like Saturn but has multiple gaps and is wider. Rolling drums for the visitor from another galaxy: HIP 13044 b.
I'm going to have to applaud your work Edasich. Your textures are masterful, each unique, realistic, and pleasing to the eye. It seems a shame to see so few of these put on the Motherlode. 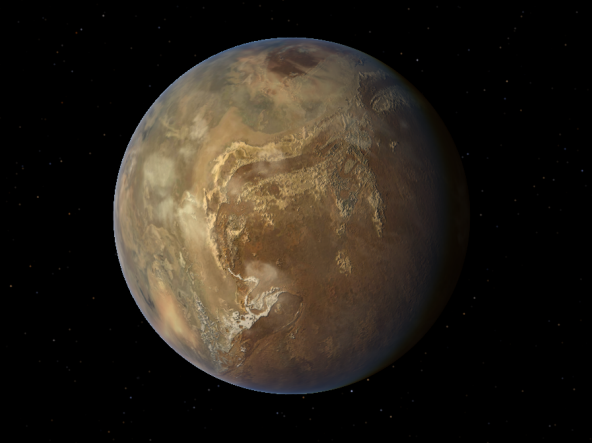 If you don't mind, I'd like to request some more of the fictional terrestrial planets. 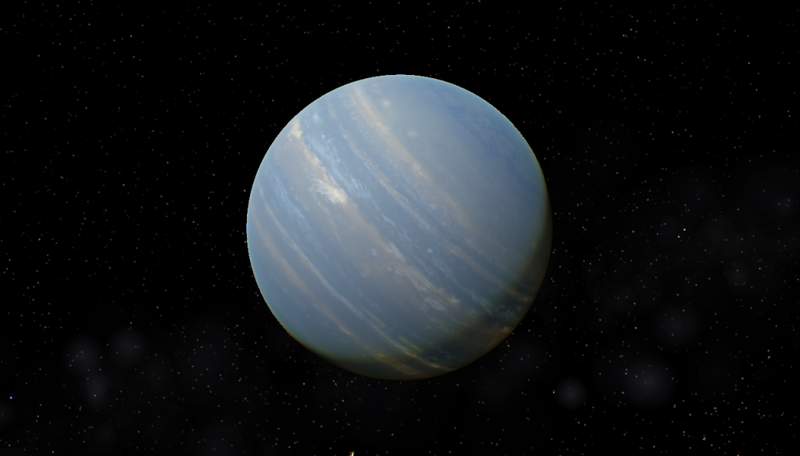 The water Jovian is awesome! All that subtle detail on the class-II hurts my eyes to look at from all the awesomeness.